Shiny Mega Shaymin Land in game: 8 Who? Important notice! Pokemon Shiny Mega Shaymin Land is a fictional character of humans. Shaymin (Japanese: ???? Shaymin) is a Grass-type Mythical Pokémon introduced in Generation IV. While it is not known to evolve into or from another Pokémon, it has a second Forme activated by using a Gracidea flower in the daytime. Its original Forme, Land Forme, will then become the Grass/Flying-type Sky Forme. Shaymin's Sky Forme will revert into its Land Forme during the night, while frozen solid, or if it is deposited in the PC. Shaymin was officially revealed in February 2008, when it was listed as a star of Giratina and the Sky Warrior. In early June of the same year, its Sky Forme was revealed. Shaymin is a small, white hedgehog-like Pokémon. In Land Forme, it has green grass-like fur on its back and a pink flower with two leaves on each side of its head, which resembles the Gracidea flower. Several Gracidea-like flowers also appear on its back whenever it feels comfortable, but when it senses an impending danger, it rapidly hides it back. Its legs are short and its underside is plump. Shaymin is the smallest Mythical Pokémon to date. In Sky Forme, it has a slender, canine appearance like that of a small reindeer. The fur on its back becomes a mohawk, and it has a red flower petal on the left side of its neck, resembling a scarf or cape. It has flat, white ears resembling wings, a small tuft of fur on the front of its neck, and a stumpy tail. Shaymin will change into Sky Forme and back if it touches a Gracidea. It reverts to Land Forme at night or if it is frozen. Shaymin can instantly purify any polluted area of all impurities in the air and transform it into a lush field of flowers. It takes in the polluted air, purifies it inside its body, breaks it down into water and light, and releases the purified substance in a violent, explosive burst. Its power varies based on the type of pollution absorbed. Shaymin can also communicate with telepathy and sense the gratitude of others. Each season, Shaymin gathers with others in a flower field somewhere and migrates from there. This behavior is called Flower Carrying because a new field of flowers grow where it lands. Shaymin is also attracted to areas where there is a lot of gratitude. Its personality is almost opposite with each form: in Land Forme, it is shy and easily scared, while in Sky Forme, it is courageous and playful. If wet, it shakes itself to dry itself off, and exhibits the behavior of scratching itself with a hind leg. Shaymin lives in fields of flowers. Since it camouflages by curling itself up, it can easily escape people's notice. It has been seen liking sweet food. Shaymin is the only known Pokémon to know Seed Flare. Shaymin made its debut in the second Diamond & Pearl series movie, Giratina and the Sky Warrior, where it was fleeing from Giratina, after enraging it in the Reverse World. Shaymin thought that Giratina wanted to eat it, when the Renegade Pokémon wanted to use Shaymin to utilize its Seed Flare to open a portal to the real world. It premiered both of its Formes in the movie. Shaymin also makes a minor appearance during the credits of Arceus and the Jewel of Life, where it stands gazing upon the land on a tree. This Shaymin had the ability to talk via telepathy. Shaymin made its debut anime appearance in Keeping In Top Forme!. A Shaymin in its Land Forme made a cameo appearance in the ending credits in Meloetta's Moonlight Serenade. DP168 Shaymin Dawn's Pokédex Shaymin, the Gratitude Pokémon. When the Gracidea flower is in bloom, its pollen allows Shaymin to change into its Sky Forme from its Land Forme. Shaymin also have a tendency to migrate. 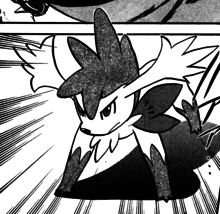 Shaymin appeared in the manga adaption of the 11th Pokémon movie, Giratina and the Sky Warrior. 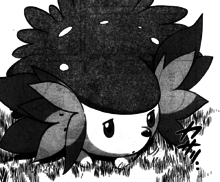 Shaymin appeared only in the Platinum chapter of Pokémon Adventures. Marley was introduced to it by a letter from Professor Oak. In the Distortion World, Shaymin tried its best not to get involved in a big clash that broke out between the rest of the Legendary Pokémon. Cyrus then caught Shaymin in his hands and showed the gratitude towards Shaymin that allowed it to transform into its Sky Forme. After Charon was arrested, Shaymin chose to stay with Marley. Hareta befriended a Shaymin at his home on Route 201. Yu Shirogane traded the movie Shaymin to his Platinum game. Shaymin appears in both Formes as a trophy in the 3DS version of the game. It also randomly appears on Unova Pokémon League, where it changes from Land to Sky Forme. It does not affect the battle in any way. NA: When in its Land Forme, this Pokémon sports a fetching pink flower. In Sky Forme, it can take to the air with ease. This Legendary Pokémon is hard to find, but it can sense anyone with a grateful heart. This ability is where the name "Gratitude Pokémon" comes from. PAL: No wonder this Mythical Pokémon is so hard to find! In its Land Forme, it looks just like a flowery patch of grass. Good luck spotting that in a field! Shaymin has two different forms, though, and in Sky Forme, it can fly. In both forms, Shaymin reacts to gratitude, hence its nickname: the Gratitude Pokémon. It lives in flower patches and avoids detection by curling up to look like a flowering plant. 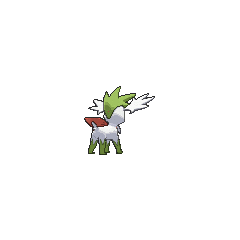 Moves marked with a superscript game abbreviation can only be bred onto Shaymin in that game. It protects itself by launching leaves. It shoots exploding seeds to attack. It attacks by launching leaves and causing explosions. Shaymin will be your Guide to the Sky Pavilion, which is reached from the Flower Zone. Shaymin's very skilled at Absol's Hurdle Bounce--and proud of it! 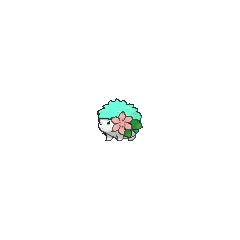 For other sprites and images, please see Shaymin images on the Bulbagarden Archives. Land Forme Shaymin is the shortest Mythical Pokémon. Shaymin's Sky Forme has a different cry than its Land Forme. In Generation IV, this cry cannot be played in the Pokédex, due to it only registering the first Forme encountered. As wild or traded Shaymin will be in Land Forme and Pokémon aren't registered in link battles, it is impossible to register a Sky Forme Shaymin. Despite this, the only cry used in Pokémon Ranger: Guardian Signs is the one of its Land Forme. A Shaymin caught at the Flower Paradise in Pokémon Platinum will be a fateful encounter Pokémon, making it the only Pokémon able to be caught from the wild that has this status. 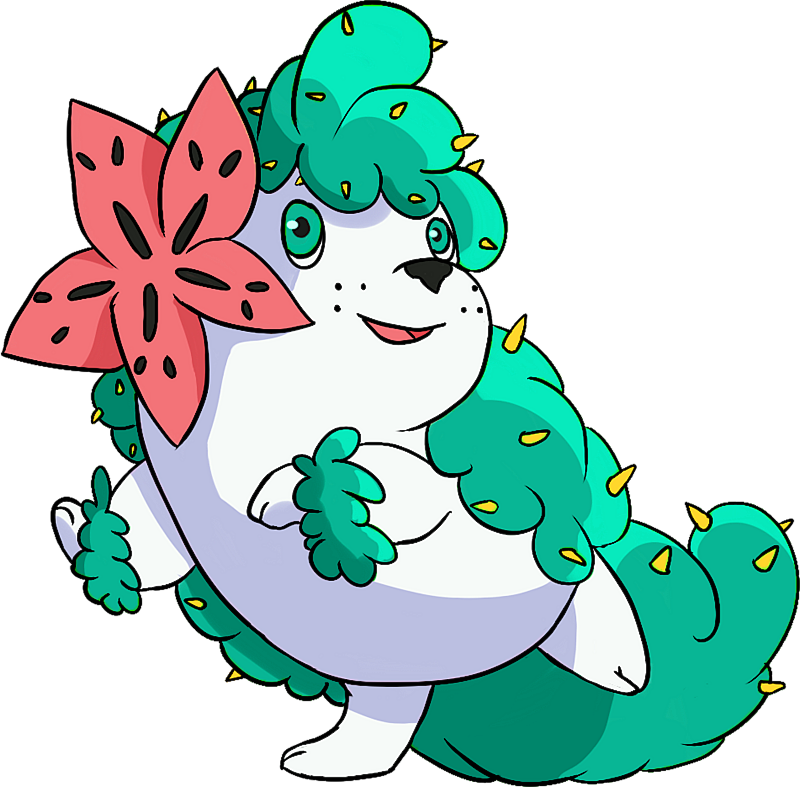 If a frozen Shaymin in Sky Forme is holding a Lum Berry or an Aspear Berry, it will eat the Berry after transforming back to Land Forme. Despite being a Mythical Pokémon, normal wild Pokémon battle music plays while battling it. It is the only Mythical Pokémon with this trait. Shaymin is based on a hedgehog. However, its white body and the grass-like fur on its back makes it somewhat resemble a chia pet as well. 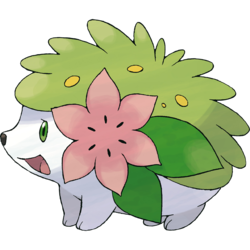 Moreover, when Land Forme Shaymin blooms with flowers, as seen in the anime, Shaymin appears as a bouquet of flowers, emphasizing Shaymin's role as the Gratitude Pokémon. 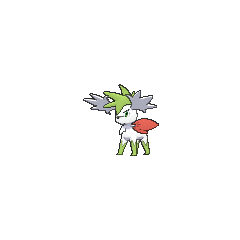 Sky Forme Shaymin shares most of its traits with a small, young terrier-type dog, but its sprightly behavior, its affinity for flowers, and its ability to fly bring to mind fairies. Shaymin's Sky Forme has a few aspects that resemble that of a reindeer as well. Shaymin may be a combination of ? xiè (Chinese for thanks/gratitude) and ? harinezumi (hedgehog). It may also involve shaman (a mystic) or stamen (a plant part). Alternatively, it may be a corruption of ?‎?? ?‎ Shamayim (Hebrew for heaven/sky), correlating directly with Shaymin's Sky Forme. Japanese ???? Shaymin From ?/? xiè, and ? harinezumi. It may be derived from shaman, stamen, or ?‎?? ?‎ Shamayim. Mandarin Chinese ?? / ?? Jiémi Transliteration of Japanese name. ? jié (clean) can also refer to its ability to purify the surrounding.